Never a company to settle for the status quo, BendPak offers a redesigned, heavy-duty deluxe turn plate set for alignment lifts. Alignment procedures are some of the most delicate and profitable operations in an auto shop, and BendPak's deluxe turn plates make these services easier to perform and yield more accurate results than other turn plate models. Great quality means faster rollbacks, more accurate alignments and higher profits overall. Never waste your money on lower-quality plates for your alignment lifts when these items are such a vital part of your shop. Typical turn plates offer a marginal ± 45° rotating ability. BendPak has re-envisioned what's possible with our 360° free-floating slip-plate design that lets wheels rotate as far as necessary for a proper alignment. The increased movement also facilitates off-center vehicle loading, so tires do not need to be perfectly centered when vehicles are driven onto the lift. 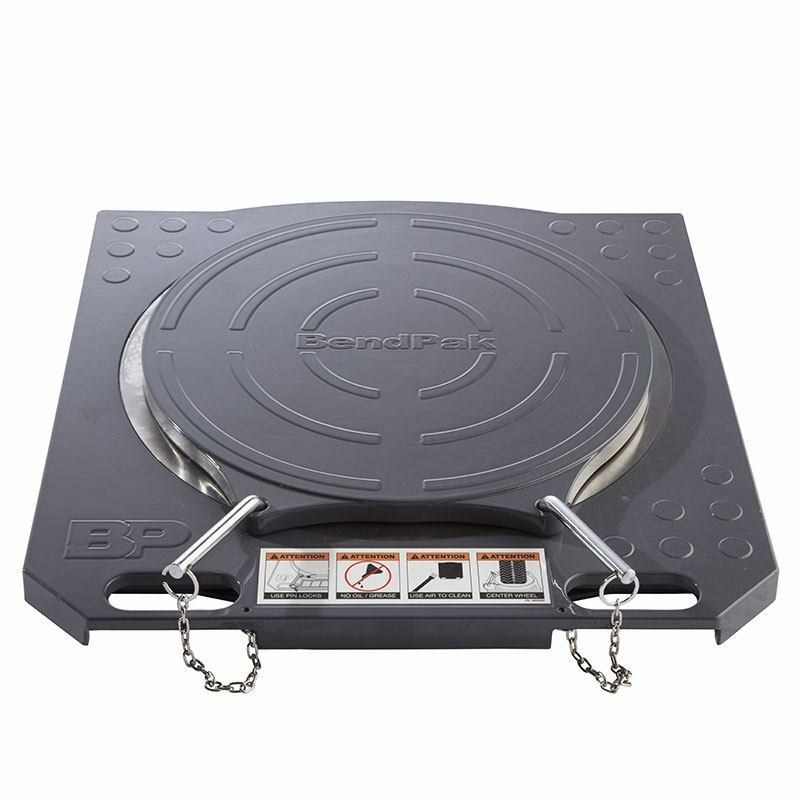 When you think "massive and heavy-duty," you don't necessarily think "portable," but portability is exactly what BendPak's deluxe turn table plate set offers. When placing or removing the plate, you'll enjoy the convenience of two built-in carrying handles that do not increase the unit's size or bulk. It's recommended that you carry each unit with two hands, one at a time, for maximum support. They're meant to be rugged enough to last the lifetime of your lift, so their aluminum alloy and stainless steel construction is truly industrial-grade. When you think rugged turn plate design, after seeing this set, we want you to think BendPak. Rollback bridges, sometimes called gap stops or "popsicle sticks" in the industry, eliminate the gap between the turn plates and alignment lift runways for a smooth transition during rollback procedures, or when loading and unloading vehicles. Each rollback bridge perfectly conforms to the contour of the slip-plate, preventing disruptive bumping and jostling that can occur when driving on and off the plate. Dual angled locking pins secure the slip-plate in place, further increasing plate stability. Heavy-duty Delrin bearings provide increased support and offer much smooth movement during rollbacks. Alignment lift turnplates that are cheaply designed feature larger and/or fewer bearings, whereas BendPak's deluxe plates feature hundreds of them. Delrin bearings are used because they resist friction, so they won't wear out. They also have an incredibly long and maintenance-free lifespan. BendPak uses smaller bearings to create an exceptionally smooth rollback experience that lets technicians get the job done faster and more efficiently than ever before.